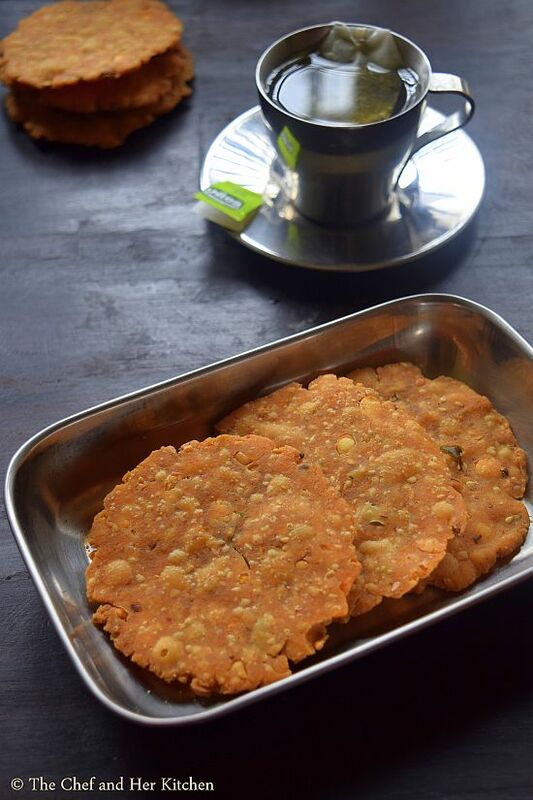 Nippattu is a popular Snack recipe from Karnataka and there are other versions of it known as Chekkalu in Andhra and Thattai in Tamilnadu.Nippattu is nothing but deep fried rice flour discs.Today I am posting a typical Bangalore style Nippattu recipe .Typically Nippat is made thicker than Chekkalu/Thattai and also the addition of peanut and roasted gram powder makes its taste quite distinct from chekkalu/thattai.Thattai/Chekkai are crunchy where as Nippattu is soft to bite and crunchy at the same time, I hope you got what I mean. Both taste good in its own way and I love both the versions absolutely.But if you ask me to pick one I would definitely go for Nippattu because of their unique taste.I must warn you that these are quite addictive. 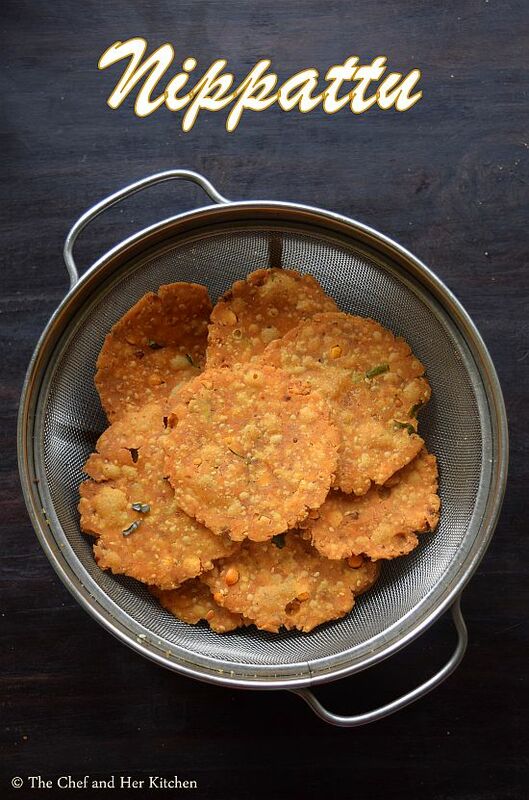 In Bangalore and in our community weddings it is a ritual to distribute a packet of these traditional snacks while inviting the guests for wedding or any big function or even distributed at the venue to all the guests along with the return gift.Typically a packet consists of a combination of Chakli, Nippattu or Kodubale, Thengolu or Manugupoolu snacks along with Pakam pappu/ Chikki and they are enclosed in a cover and neatly pinned with haldi kumkum packet. 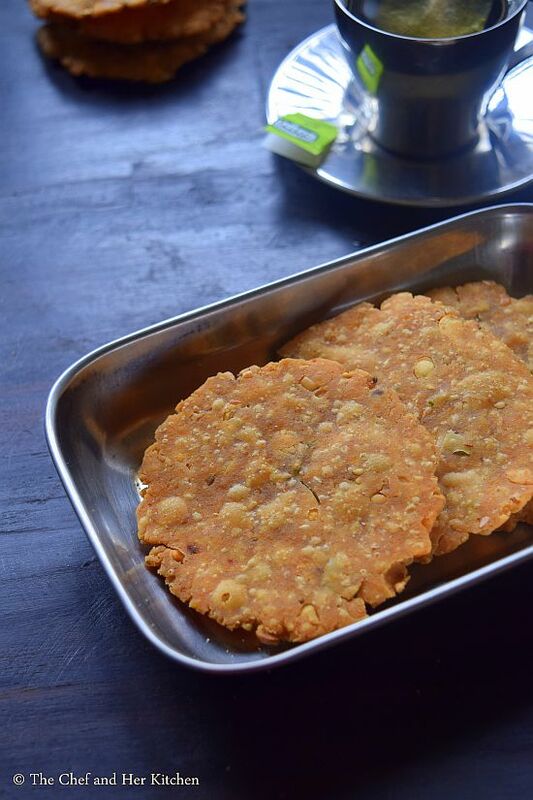 If it is a wedding of a close family member then the number of snacks would be in large quantity,it can be easily filled in a medium sized carton. I still remember how we used to gorge on these yummy snacks after we go back home for several weeks,simple pleasures of life!! 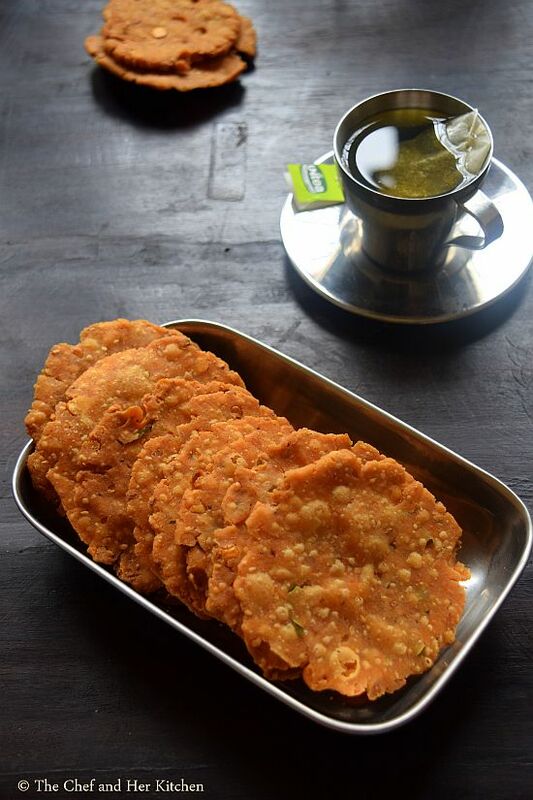 Nippattu is very versatile ,it can be eaten as a snack with a cup of chai or turn it into few chaat varieties- Nippat masala and Bun nippat .We get a very popular chaat item in Bangalore called Nippat masala which is made using these nippats or tiny nippats and I love it to the core. Now off to the recipe. Grind roasted and skinned groundnuts to a COARSE powder or crush it using a rolling pin. Keep aside 2 tbsp of roasted gram and grind the remaining roasted gram to a COARSE powder. In a large bowl add homemade rice flour, coarsely ground peanuts, coarsely ground roasted gram,sesame seeds, roasted gram, grated dry coconut, finely chopped curry leaves, salt, red chili powder and asafoetida and mix it nicely.Add HOT oil to it and mix again nicely and press the mixture tightly and cover it with a plate. Leave the mixture aside for an hour.If you are in a hurry you can proceed further but it is ideal to leave the mixture aside for sometime. Divide the mixture into 2-3 portions and sprinkle water to one portion and knead into a dough. Do not add more water,use little amount amount of water just to combine to a dough.Knead well.If you take a small ball and try to flatten on your palm it should crack at the ends which indicates right consistency. Take a plastic sheet and smear oil over it.You can even use milk covers. Mean while heat oil in a kadai over medium heat to its smoking point. Take a small lemon sized ball and flatten it using your palms to a thick disc of 3" in diameter on the greased sheet.This nippattu should be slightly thicker than the regular thattai/chekkalu. Repeat the process and make 6-7 for a batch. Drop them carefully one by one from sides of the kadai taking care that they don't get fold while dropping into oil and fry them and turn them to the other side and fry until golden brown in color.Always fry in medium hot oil otherwise low heat will result in very hard nippattu and high heat will result in soft nippattu.It is always better to taste in between to check whether you are getting the right crispiness or not. Drain them on kitchen napkins to remove excess oil.When you fry them they would have light golden color which turns out deep dark brown in color after they become cool and they also become more crunchy afterwards. Cool them and store them in air tight container. 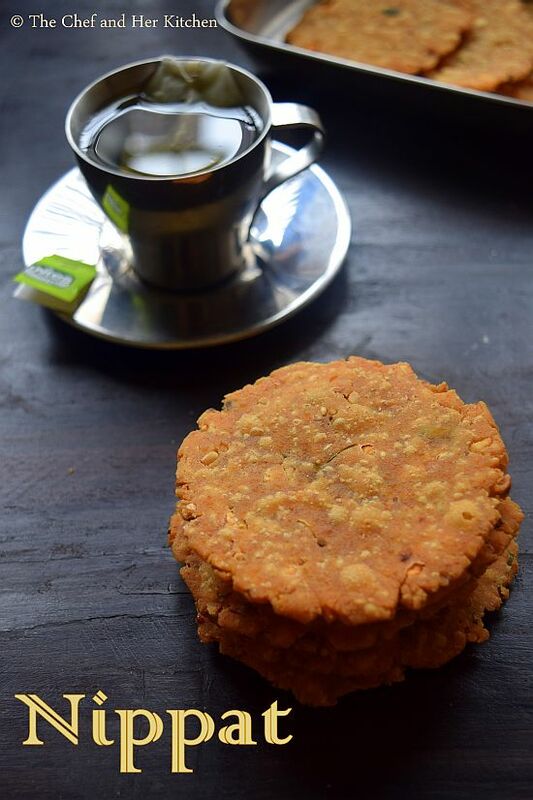 Serve as a evening snack with a cup of tea. Always use freshly ground rice flour(washed,dried and milled) instead of the one available in grocery stores for good and crispy Nippattu.Rice flour quality is the key factor for the taste and texture.If the rice flour is very finely ground(like what we get in grocery stores) it will result in hard chekkalu,if it is mill ground with a slight coarse texture they yield good crackers. You can double the recipe and adjust the other seasonings as required.The spice level is according to your wish and also add the roasted gram proportionately. If you are making in a larger portion,once all the ingredients are mixed well add water to only some portion and make the batch and then add water to the remaining batch.It is very important to do it in small batches else the dough becomes soggy and not gives crispy nippattu. For a different flavor, you can add finely chopped coriander leaves to the dough. The rice flour used in the recipe if we need to make it at home needs to be washed ,dried and then powdered? Can't we just powder the rice just like that?